Taking a design from start to finish, on time and on budget, demands practical knowledge and experience. In part, it's a matter of knowing every step — and potential pitfall — of the construction process. In part, it depends on keeping communication channels with clients wide open, from the first sketches to final walk through. It also comes down to the quality of construction documents. We set the standard with technical documentation that makes all the difference whether we're executing complex designs or restorations or meeting the demands of a tight bidding process. 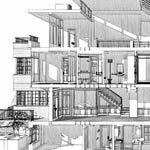 Using BIM technology, we coordinate many phases of the design and building process once considered beyond our purview. In addition, our proprietary database programs enable us to handle project details, generate owner-friendly reports, avert conflicts and realize greater time and cost efficiencies.